Tycho Brahe, who had a post dedicated to him last Saturday, in the 1500’s helped Kepler develop the laws of planetary motion by providing significant amounts of raw data – an effort which truly anticipated the spirit of the Scientific Revolution. 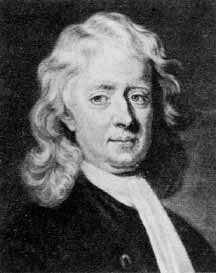 Isaac Newton came along and wrote in 1687 the Philosophiae Naturalis Principia Mathematica, a momentous work in natural philosophy (science, that is) in which he enumerated some rules he used to facilitate and purify the study of science. The rules were these: 1. That a scientist attribute truth to causes of things only that are true and sufficient to explain phenomena, and not to superfluous ideas. 2. That the same effects be associated with the same causes. 3. That the “qualities of bodies are to be esteemed as universal,” in other words, that gravity affects you and Mars similarly because you both have mass, take up a definite space, et c. 4. That theories about nature, produced by observing nature can only be disproved by other observations of nature (basically). This first formalization of the scientific method made science efficient by eliminating the arbitrary impositions of non-observationally-based ideas on the observed world. The rules acted as a wedge between science and superstition; Newton essentially completed the methodological and philosophical work of those before him (particularly relevant here is Galileo’s divorce of natural philosophy from the study of religion). But he was not entirely consistent. He could not seem to find a way around the idea that God arranged the solar system by hand and “tunes” it regularly so that its behavior is consistent.